Which reality shows have the most influence on you? While you may come up with various genres and names, quite surprisingly cooking shows, perhaps, have the most influence among the masses. You may love Fear Factor, but will you consider sitting in a tub full of snakes? Similarly, people may go crazy for American Idol, but how many of them actually tried singing after watching this show? But when it comes to cooking shows- be it a competition or a tutorial- many of us do try it at home. Experimental and amateur cooking has never been such a massive hit as it is now. And it's no surprise we love experimenting with food. We love food, after all. We love to eat; and cooking is simply the opposite side of the same coin, the other end of the spectrum, if you will. But a large part of this growing interest in experimental cooking has been due to the cooking programmes on TV. That entertainment box which sits in your house is the ultimate determiner of your choices and preferences, habits and lifestyle. And it provides you with numerous cooking programmes that entice you to try recipes yourself. On the other hand, many people enjoy watching cooking shows on TV where they show you how to prepare certain dishes on each episode. People write down recipes furiously to try their hands at later. Now, where on earth have you seen such dedicated audiences other than on those cooking shows? Yes, right from Kylie Kwong to our very own cooking genius, Siddika Kabir, these cooking shows have tempted us to try cooking and come up with new recipes of our own. However, for many people, amateur cooking is just another phase. 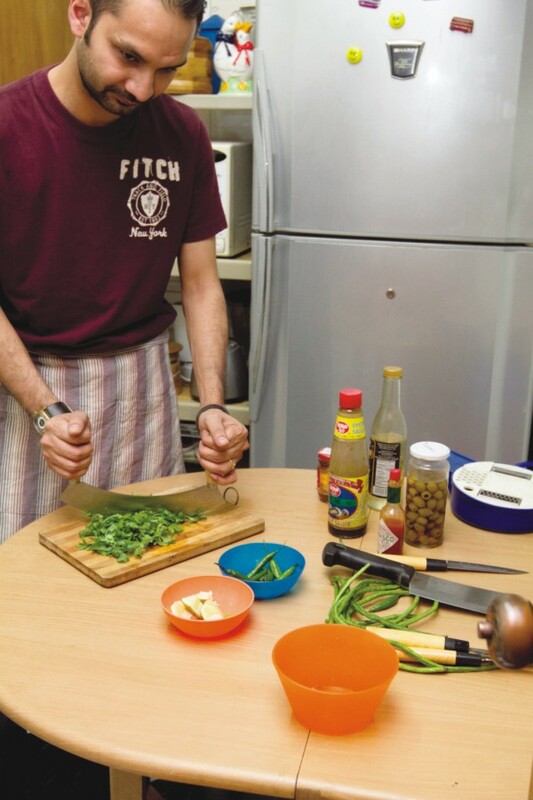 “I was very passionate about cooking for about a year or so. For me, it was one of those phases you go through being obsessive about something, like photography, painting, etc. For most people, the phase eventually goes away,” says another. Yet many others find continuous joy in experimental cooking. Some of them do not even like cooking traditional foods. “I love to experiment and try out new things. If you give me some random ingredients- even leftovers from your last meal - I'll be able to integrate those, use a few flavours, spices and what not, and make a decent meal,” says another enthusiast. But things can get out of hand if you are inexperienced. Passionate amateur cooks create perfect recipes for disaster. When it comes to disasters in the kitchen, we are talking of two types. The first is the very hazards of cooking: dealing with fire, knife, etc. “There have been more than one incident where I feared I might burn down our house,” another amateur cook said. Secondly, sometimes you end up with a food so ugly and so bad in taste that you feel like throwing up. Experiments, after all, are not always successful! However, things are always not so appealing. When we think of a chef, or cooking, we tend to label it as a highly innovative and passionate thing to do. Although this is true for amateurs, who feed on those exciting and thrilling shows on TV, in reality, being a chef or a cook may be a different story. Anthony Bourdain, the food maestro who inspired so many to fall in love with cooking, admitted it himself. While the process of creating recipes is quite innovative, once the recipes have been made, the cook very strictly adheres to it. Cooking can be, in fact, a very monotonous and tedious job to do, he argued. A professional chef aims at precision and discipline, perfecting the same old recipes, sometimes being an autocrat to his subordinates. But as for you, it's great as long as you are having fun with it! For a scientist, there are a few things in life more exciting than creating a new invention, and, for an amateur or experimental cook, there are few things in life more exciting than creating a new recipe.